2019 Calendar. Economy 3 month quarterly calendar with European Styling. Three separate monthly pads. 4 Backer Panels. The calendar pads are staggered with the previous month, current month, and after month. Deluxe Wire-O Binding. Julian dates & numbered weeks. Folds to 8"x11" for mailing. Includes 7"x11" full color picture. Deluxe 12 point backer board with 60# offset paper. UV coating top panel for extra pop. 2019 Calendar. European Styling without the European price. 4 panel / 3 months at a glance. Back panel is heavy 20PT coated paper. Back panel is scored for folded. Price includes 4 color back panel. Glue bound. Brand New three month calendar. Only 50 piece minimum. 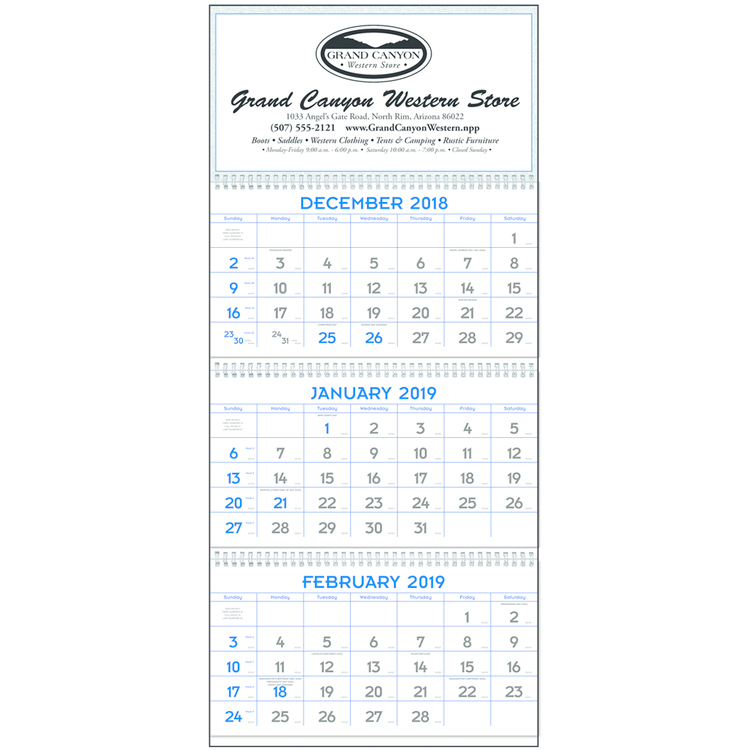 Calendar features full color custom image at top of the quarterly calendar. Top photo is padded to calendar portion. 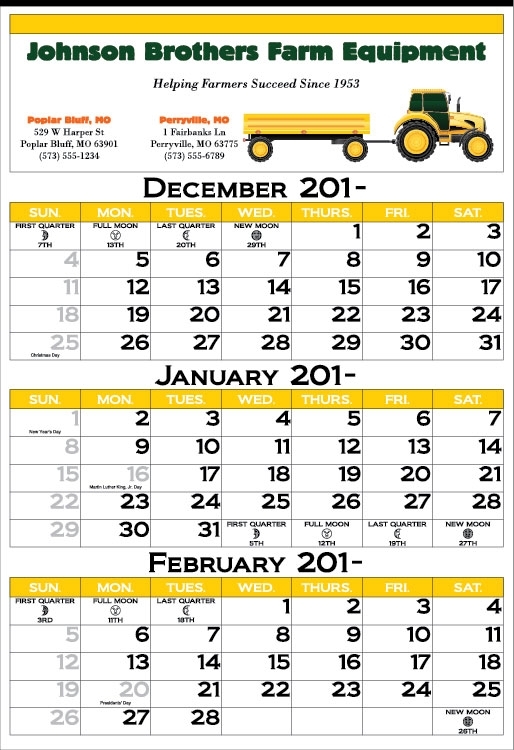 Calendar has 3 separate calendar pads attached to a 14PT C1S backer that is scored and folded for easy mailing. Middle calendar pad is the current month while the top pad is the before month and the bottom pad is the after month. At the end of each month, simply tear off a sheet from each pad. Red date slides are available to make the calendar even more user friendly. 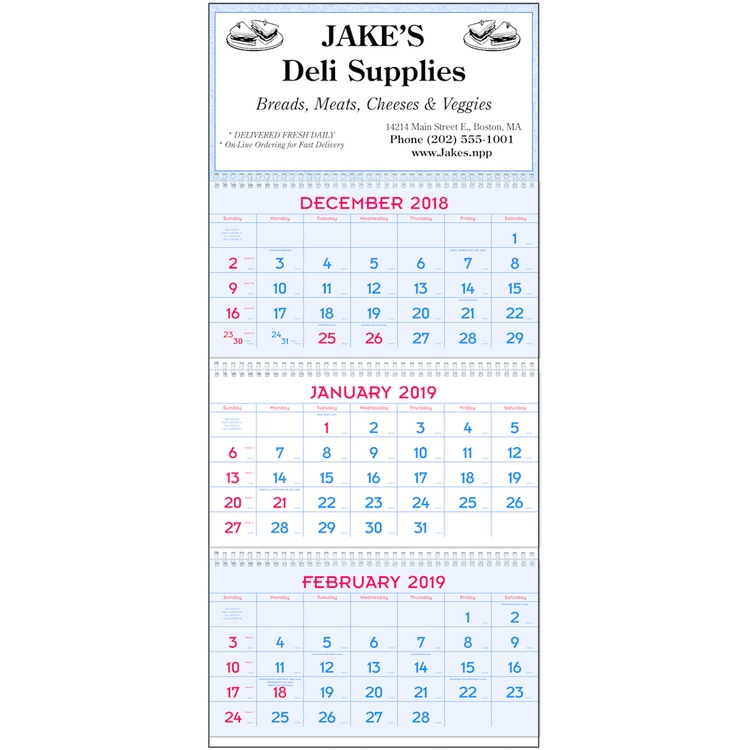 Based on a 12-sheet calendar with three months on each sheet (current, previous, and next); spiral on the 7" side with a drilled hole for hanging. 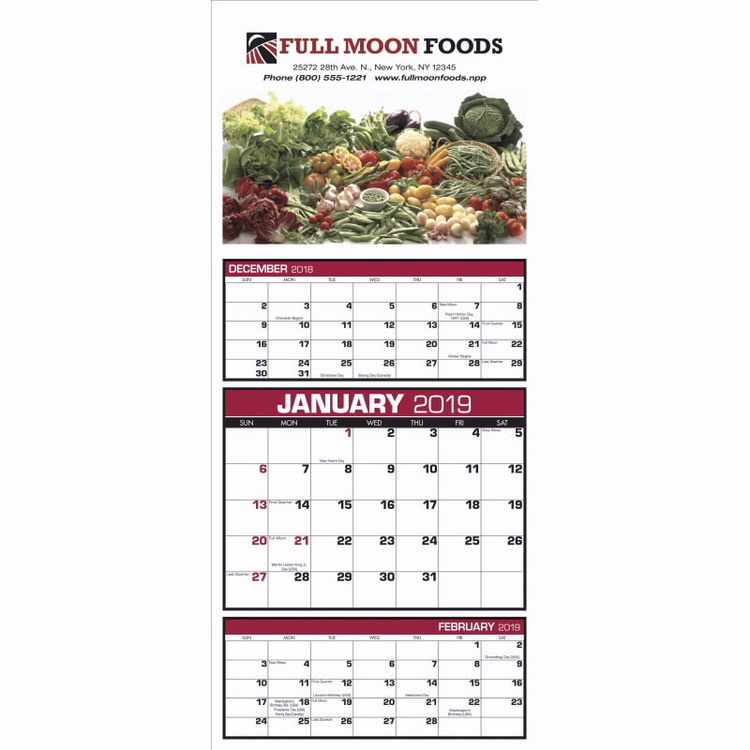 This calendar prints in four-color process on one side of each sheet. 2019 Calendar. Deluxe 3 month calendar (4 panel) with European Styling. Three separate monthly pads. Deluxe Wire-O Binding. Julian dates & numbered weeks. Folds to 8"x12" for mailing. Includes 7"x11" full color picture. Deluxe 12 point backer board with 60# offset paper. UV coating top panel for extra pop. Image shown with black backer panels ($150 (G)). Put this unique custom wall calendar to work for you. Small 3 months on a sheet. Holidays and moon phases are shown only on the present month. The before and after months have a screened background. 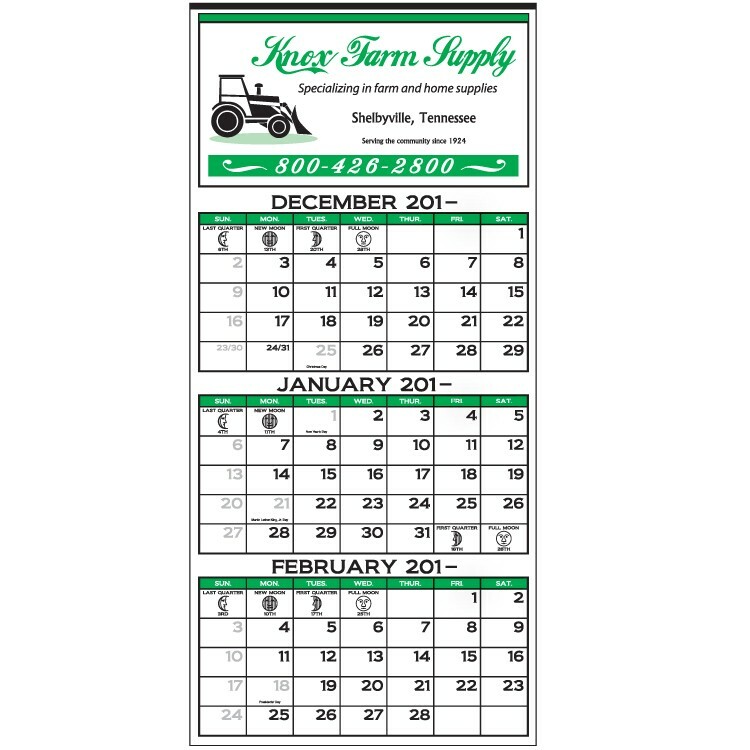 This style has been a very popular twelve sheet calendar for an increasing number of clients. 3-Month at a Glance 12-Sheet Calendar. Choose one of our six standard colors to create a custom look without the custom price! 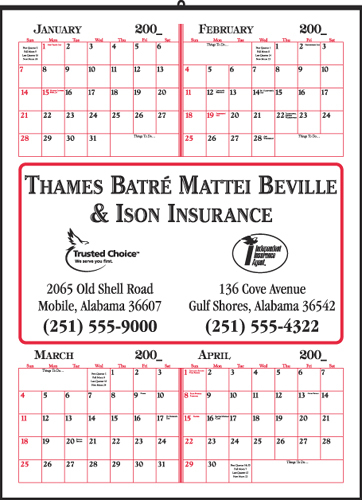 The Style 116 features 3 prominently displayed months per sheet, two reference months and the feature month in the center. The current month shows the changing phases of the moon, American and Canadian holidays. The before and after reference months have a screened background visually setting them apart from the current month. The reference month Sundays and National Holidays are distinguished by “outline type”. This Calendar is visually large and has ample space for Ad Copy. Three sheet calendar with 4 months on a sheet. Each month has a small area titled “Things to Do” for appointments or other information. The “Daily Date Block” is as large as possible (1-1/4" X 1-1/4") to allow for abbreviated notations. The focal point of the Style 150 is the large ad space. Ad Space is in the center enclosed with a solid 3/16" inch border with a unique rule between months which flows to the ad copy area. Due to just three sheets the shipping weight is considerably less than a twelve sheet calendar, creating less shipping charges. 3-Month at a Glance 12-Sheet Calendar. Personalized Three Month Wall Calendar (1 Pictures) "In the Image"
Showing three months at once, this calendar is easy-to-read and useful. Simply tear off the old month at the perforation and a new one appears. This 14 month calendar runs from December through January. The 4-panel/3-pad style is twin-looped and has a large imprint area. 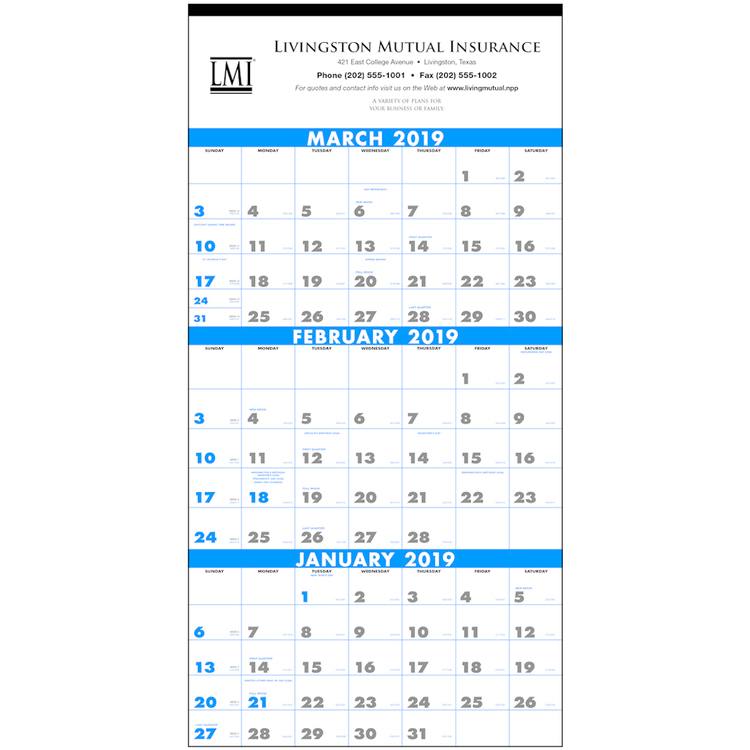 The Style 117 features 3 prominently displayed months per sheet, two reference months and the feature month in the center. The current month shows the changing phases of the moon, American and Canadian holidays. The before and after reference months have a screened background visually setting them apart from the current month. The reference month Sundays and National Holidays are distinguished by “outline type”. This Calendar is visually large and has ample space for Ad Copy. Brand New! 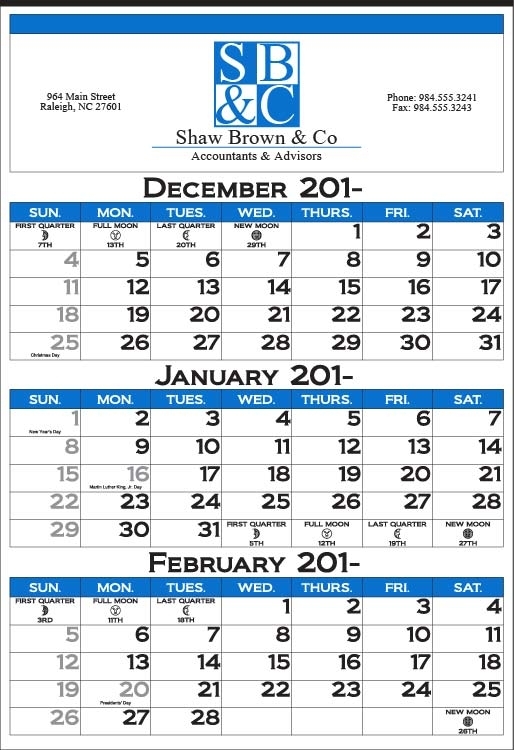 Calendar features full color custom image on top panel. Top panel is attached to calendar pad with deluxe wire-o binding. Pad has 12 sheets with 3 months per sheet. A brass grommet is also included for hanging. This 14-month calendar runs from December through January. The 4-panel/3 pad style is twin-looped and has a large imprint area.